PrO2FIT is an early stage startup company that is a spinoff of Design Net Technical Products in Smithfield, RI. PrO2FIT develops measurement and training products for the fitness and wellness market. Our products promote healthy lifestyles and are not intended to diagnose or treat any disease or medical condition. Why did you build the PrO2 Device? PrO2 provides real insight into your fitness level and allows you to improve it through training on the same device. Prior to this, there was no mainstream product that could measure the performance of our aerobic “engines” that is as simple as stepping on a bathroom scale. The PrO2 FIT score provides this in one breath. How is PrO2 different from what is currently available? While some other devices claim to train the inspiratory muscles, few train them properly. PrO2 uses an enhanced version of the Test of Incremental Respiratory Endurance (TIRE) protocol. This ensures that the muscles are worked to fatigue, which is necessary for muscle development. The inventor of the TIRE protocol came to us with an early, desktop version of the device and nearly 20 years of documented benefits using this training approach. The benefits were amazing – reduced breathlessness, increased performance – there have been studies in many sports including running, hockey and cycling. We just couldn’t ignore it, we simply had to bring this to market. 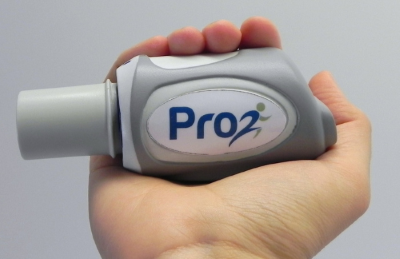 PrO2 is a spinoff of Design Net Technical Products, a product-development firm with a nearly twenty-year history of developing consumer and medical products for companies ranging from start-ups to fortune 500 companies. Design Net co-developed the company, the product and the technology used in the PrO2 product. We’ve just launched our Kickstarter campaign. We hope to surpass our goal and get the first PrO2 devices in the hands of our backers.